Welcome to the Marian Koshland Bioscience, Natural Resources & Public Health Library! This is the entrance to the Marian Koshland Bioscience, Natural Resources & Public Health Library located in the Valley Life Sciences Building (VLSB). 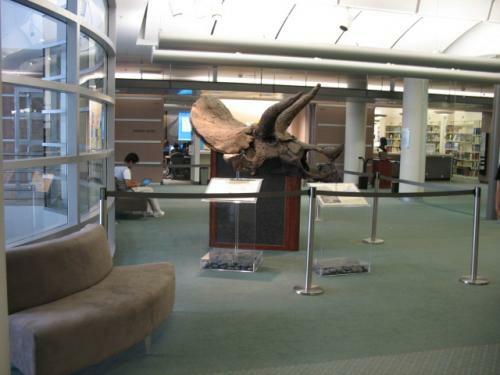 Pictured above is our lobby featuring a genuine, 65 million year-old Triceratops skull and a cast of a baby Triceratops skull. Agricultural and Resource Economics, Agricultural and environmental economics and policy. Borrow or return books, find course reserves, pick up holds, or place searches on missing materials. Your CalNet ID is your library card. Our student circulation staff can help you with most non-research questions. Please visit our Borrow page for borrowing policies and other circulation information. The reference area is to your left as you walk into the library. It includes the Reference Desk and the Reference Collection. The Reference Desk: Come to the reference desk to ask questions about how to find books and journal articles, and get help searching appropriate databases. Reference librarians can also help you get started on a research project. The Reference Collection, located behind the Reference Desk, includes encyclopedias, dictionaries, atlases, and other reference sources. The library has over 40 PCs that can be used with your CalNet login. These computers are loaded with software including the Adobe and Microsoft suites and ArcGIS. There are also nine internet-only workstations in front of the reference desk on the east wall that are available without a CalNet login. Research access on these computers allows you to use databases, ebooks, and ejournals. Downloading to a USB drive is free. All computers are networked to a printing station, and color and black and white printing is available using a Cal 1 Card or Guest Card. New books and journal issues are put here on display each Monday. New books and journals are non-circulating during the week when they are on display. You may place a hold on a book by taking it to the circulation desk. In addition to print journal subscriptions, there are over 10,000 journal subscriptions available electronically. 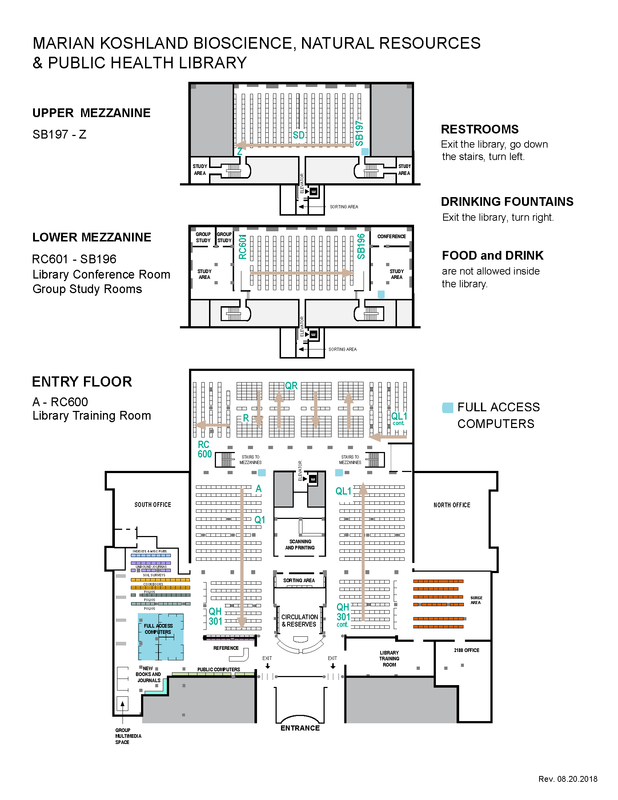 There are two group study rooms on the lower mezzanine. There are also three group study areas on the main floor in the corner by the new books and journals area. One of these study areas is a mediascape carrel that has a monitor that can be connected to a laptop. There are no advanced signups for these group study spaces, but groups of 4 or more have priority. The folios (oversized books) and the cookbook collection are on the shelves behind the research computers. Beyond the cookbooks are the Soil Surveys (focused on California and other western states), the Regnum Vegetabile series, the unbound journals, and the print indexes. Unbound journals are kept in alphabetical order usually for about six months to a year. Once bound, journals are shelved by call number in the stacks. The call number is indicated on each issue of the current journals. 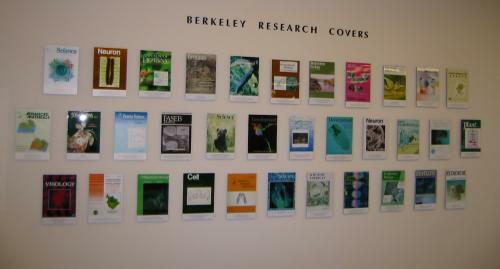 Reproductions of journal covers that depict articles published by Berkeley researchers are displayed in several locations in the library. There are also prints of photographs taken by Mark Moffett, and a small collection of Irving Geis prints. In the printing and scanning room there is a color printer, a black and white printer, and several scanners. Scanning to a USB drive or to email is free of charge. For more information, please see Printing and Scanning in the Libraries. There are many pleasant places to study in the library. Please see information on Wi-Fi in Libraries. At the back of the library on the main floor are several aisles of compact shelving. Please check to make sure that the aisles are clear before moving the stacks. Behind the compact shelving are several quiet study carrels.